SMYRNA, Del. 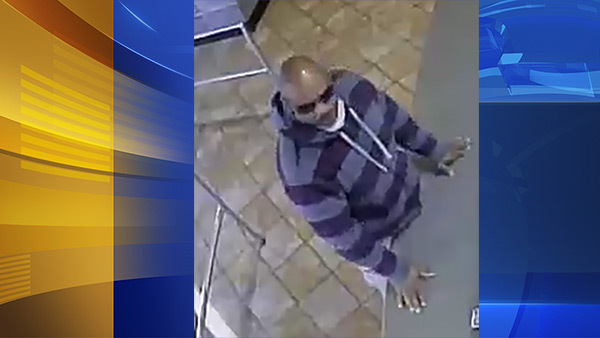 (WPVI) -- Police are asking for the public's help in identifying a suspect allegedly involved in a restaurant robbery. It happened around 7:45 a.m. Saturday at the Hardee's located at 100 Jimmy Drive. According to police, the suspect lunged over the counter and forcibly removed a sum of money from an open cash register when it was opened by an employee completing a transaction. The suspect is described as a light-skinned black male, 35-45 years of age, 5'10 to 6' in height with an average build and thin facial hair. He was last seen wearing tan cargo style pants, a grey striped sweater, and sunglasses and had a surgical mask around his neck. Anyone with information is asked to call 302-653-9217. Tips may also be submitted via SPD social media private message or through Delaware Crime Stoppers; Delaware.crimestoppersweb.com (1-800-TIP-3333).